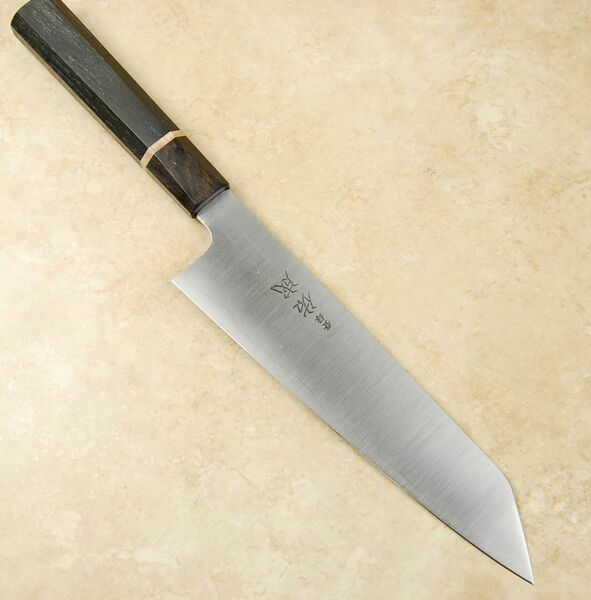 The Sukenari AS Hairline Kiritsuke is a knife possessing many virtues and strengths. It is constructed from Aogami Super high carbon steel. An outer layer of softer stainless steel is applied to either side of the core to protect and strengthen the blade. It also aids with ease of maintenance. This laminating process is called san-mai. The inner core of AS steel is hardened to 64 HRC, resulting in a blade that is durable and has great cutting abilities and edge retention. The inner core remains exposed at the edge and spine so care should be taken to dry the blade between uses. 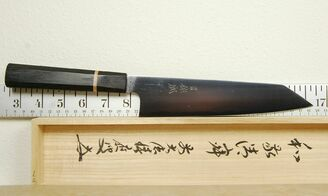 The kiritsuke is often a single-sided blade, but this example is ground with a symmetrical 50/50 edge geometry. This design makes the knife both easier to use and sharpen, especially for users less accustomed to the peculiarities of a single-sided Japanese blade; it�s a good choice for righties and lefties alike. 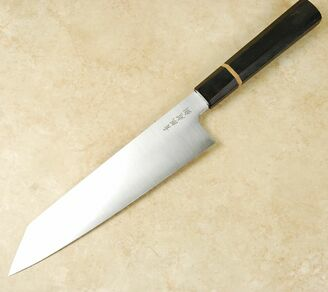 It also makes the knife a great alternative to a classic gyuto, but with a very flat profile and that characteristic tip. 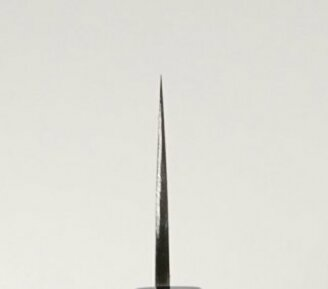 This design feature adds functionality to the blade when more delicate cutting or other refined processes are called for. The knife is coupled to our exclusive bog oak octagonal custom handle with a maple spacer and tapered blackwood ferrule. It's a great match to this special knife.